Here you can Download or Request all of our operational documents. As a Professional Drone Operator we are more than happy to share any of our documentation with our clients although due to the nature of some of the documents, a non disclosure agreement (NDA) may need to be in place first. If there are any documents that you need that aren’t here, please email info@echoalfa.co.uk. Here you can download a copy of Echo Alfa Limited’s Permission For Commercial Operations. The Permission for Commercial Operations (PfCO) is granted by the Civil Aviation Authority and must be renewed annually. Here you can download a copy of Echo Alfa Limited’s Operating Safety Case (OSC). The OSC is granted by the Civil Aviation Authority and must be renewed annually. This OSC grants Echo Alfa pilots enhanced operating permissions compared to a standard PfCO, such as reduced control distances for take off and landing and during flight. Here you can download a copy of Echo Alfa Limited’s Summary of Insurance Cover. Our insurance is provided by Coverdrone (John Heath (UK) Limited) and is underwritten by Lloyd’s. If you would like to verify this document please call Coverdrone on 01270 252 252 quoting policy no. CDA22063990GBP. Here you can download a copy of Echo Alfa Limited’s Terms and Conditions. Here you can download a Site Permission Form. We must have permission from the land owner of any site we operate from. 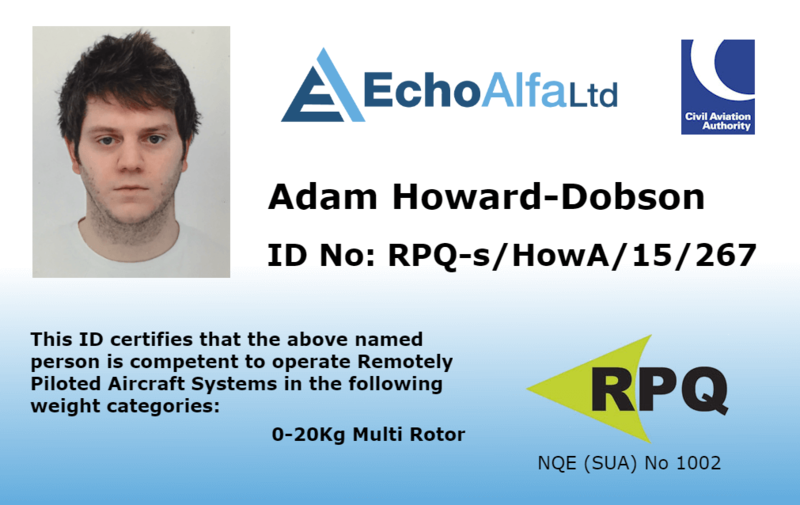 Here you can request a copy of the Pilot Competency Certificate for Adam Howard-Dobson. This qualification certifies that the named person has demonstrated a level of pilot competency; a requirement as part of a UK CAA “Permissions to Operate”. 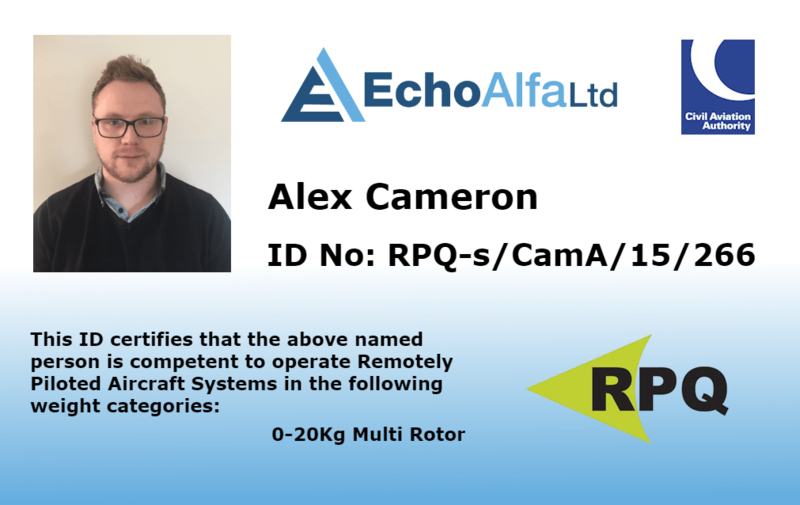 Here you can request a copy of the Pilot Competency Certificate for Alex Cameron. This qualification certifies that the named person has demonstrated a level of pilot competency; a requirement as part of a UK CAA “Permissions to Operate”. Here you can request a copy of Echo Alfa Limited’s Operations Manual. The Operations Manual is a living document that is continually updated as our business develops. It is a CAA requirement for a Permission For Aerial Work. Without it, we cannot operate commercially.